OK, it's official. Smartphones are too big. Every year, manufacturers make bigger phones, and consumers line up for them. But, bigger isn't always better, people. At this rate, we'll be using smartphones as big as houses within 10 years. It's madness. Do you really need a bigger phone every year? When I put the average-sized 5.2-inch Moto X (2nd Gen) in my pocket and tried to sit down, guess what happened? My pants ripped as I tumbled over. So, for some of us, the average size is too large. But, as I said, phones get bigger every year. The next generation of the Moto X produced the whopping 5.7-inch phablet Moto X Pure. At a whole half-inch bigger than the phone that caused my pants to rip, I wouldn't recommend you put this one in your pocket either. Nor can I recommend trying to use the phone one-handed, and I say this as someone with big hands. Products and tools that are meant to be used with human hands tend to be sized for, you guessed it, human hands. You can expect books, scissors, door handles and steering wheels to be of a certain consistent size. Scissors don't get bigger every year. Though for some reason smartphones do, despite the fact that the average male's hands remain a consistent 8.1 inches every year. Scissors don't get bigger every year, so why do phones? At what point is it enough? Either when manufacturers get the point, or when humans evolve into giants. Until then, we should accept that our hands simply aren't big enough to operate ever-larger smartphones. Let's face it, every phone that came after the 4-inch Galaxy S was too big to comfortably make phone calls. Not too big to actually call someone, but rather too big to make calls and not look as though you're playing hide-and-seek. Remember when making calls with a sleek new phone used to look cool? Your face is too small for phones to get bigger. Whether you're fashion conscious, or even just conscious, there comes a point at which phones are simply too big to make calls comfortably and without looking like a big dork. But, do you make calls that often anymore? There's a reason why a majority of our communication is done via WhatsApp, Facebook Messenger and email. Phones are just too big to put up against our faces nowadays. Should you buy a larger phone every time you upgrade? This is something to factor into your purchasing decision. Think about the practicality of its size and imagine, if you go on-contract, what it'll be like carrying a giant brick in your pocket every day for two years. Think about the story I told you, and ask yourself, "Can my pockets handle the phone without ripping?" Opt for the 5-inch Google Pixel instead of the 5.5-inch Pixel XL. Or, go even smaller with the 4.6-inch Xperia X Compact. For me, around five inches is about perfect. 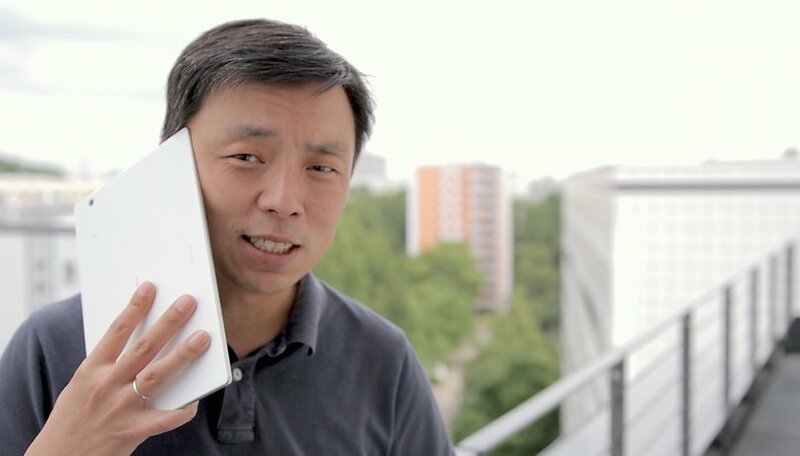 For you, a phablet like the 5.5-inch OnePlus 3T might be best, if you're a giant. But, I urge you to think about whether you really need a bigger phone, because I doubt your face and hands are getting bigger every year. When is enough, enough? What's your optimal phone size? Let me know in the comments. Calling people an idiot because you disagree their opinion makes a fool out of yourself! I had a 5-inch regular Z1 on a 2-year contract but after 14 months I wanted out. Bigger screens would be OK if the bezels didn't make the whole phone so big. The S8 seems too long. I now have a 4-inch iPhone SE and am still surprised by how easy and ergonomic it is to use. The keyboard is small but glide typing with Gboard takes care of texting. There is such a thing as big enough. For now, with the phones currently available, I will not sacrifice compactness. My 4.6-inch Z5 Compact was absolutely perfect and I would never want more. The bezels were beautifully small. For those who are truly passionate about large diagonals, they can use a 10 "tablet as a handset, and then they even solve all the chores, or just as well for those who truly love big diagonals are the 24" you practically use a TV for your phone calls. My personal opinion is that a 5.5 "diagonal is enough for anyone who wants a relatively large screen, or a maximum of 5.7 or maybe 6" for 18: 9 screen phones, in which case the edges of the screen be very narrow. I can see that the trend is big diagonal, about 5.5 ", a diagonal that offers good quality to read various information. For general use, even 5 to 5.2" screen phones are very practical and very easy to use with one hand. It's just a taste of taste. Well, after the death of my Z3 Compact 4 days ago, I had no choice but to buy a big one yesterday, because Z5C is almost the same thing as Z3C in hardware and expensive (sony totally screw it), and Xperia XC is too expensive in my country. The other small phones are too weak in hardware, so I had to move from a 4.5 inch to a 5.5 inch phone (Moto Z play). I do not know how I am going to handle that since I hate these big screens (and my hands are small if compared to man average hands size). Unfortunatelly it was the only option with a current acceptable hardware which I could afford. My friend has a Z3 5.2 inch, for me it is big, not outrageously big, but big. I hope I will get used to it. As long as it fits in my pockets (I hate have to carry any kind of bag, men usually do), I think it will do fine. I'm still waiting the delivery. I don't blame the manufacturers for doing big phones, because in fact they should. But I like the high performance and small screens (anything between 4.5 and 5). The sad part is, the only flagships in small size today are with Sony. If you want to reduce size in other manufacturers, you also drastically reduce hardware . For me 5.7 inches was perfect. That phone has since been recalled and a 5.5 inch Edge is standing in until the S8 Edge or Note 8 is available. As for too big, I'm always using Bluetooth and hold my phone like a tablet - using both hands most of the time. Considering the studies that talk about how filthy an average phone screen is, who wants that next to their face anyway? 5.0" is too big, bring back 4.5". I need a replacement for my 1st generation Moto X and there is nothing available that size on verizon. I don't watch videos or play games and I prefer to use my phone one handed. I am a big guy (6'3") but I like small phones. Moto X (1st generation) is the best smartphone I ever had. The display position is the best, and also the best design for hand. For me, it's got to be 5.5 inches or bigger. I've got the S7 Edge, which is perfect because it has a high screen to body ratio thanks to the curved edges. It's not bulky like the Iphone Plus and has the haptic and physical home buttons so even the bit beneath the screen is usefull space. I honestly couldn't go back to a smaller, non curved phone easily! Thanks for sharing your opinion! Do you use a headset when you make calls? Or do you hold the phone up to your ear? I just got a ZTE Zmax Pro, a whopping 6" "phablet". I LOVE IT! For one thing, now I don't feel that I'm just speaking out into the air, but actually INTO THE PHONE. I always hated that about tiny smartphones. For another very important point... I really hate, loathe, and despise phones and phone calls; I can forgive mine for being a phone, because it's actually a computer -- which I love! It may be huge as phones go, but it's quite small, as computers go; it's considerably smaller than my 7" Samsung tablet, and MUCH faster, being an octa-core; it may even be faster than my dual-core i5 laptop PC -- which can't make phone calls. But anyone who says that a 6" phone is huge apparently doesn't recall when phones were metal, were attached to the wall, actually *dialed*, and made a "scritch" sound while doing it. THOSE phone handsets were huge, and also heavy -- probably about the same weight as my 6" handheld computer with case and glass screen protector... which also happens to be a phone. Andria, I remember the funny old days of huge landline phones mounted on the wall. We're so lucky to live in a time when we have phones/computers that can fit in our pockets (and the option to text instead of making dreaded phone calls!). Thanks for your comment! Still, nothing conveys your feelings like a phone call. My family would rather receive a thoughtful call than a cold text. Most of my family wouldn't know what to do with a text. ;) But it's better to text my husband at work, if it's not terribly important -- hate to interrupt him at work just to tell him to stop by Kroger on the way home. :D But speaking as a relative newcomer to smartphones... it took me only a few weeks to be really glad for the nifty computer in my purse, if I needed to look up a location, or whatever. I resisted mobile phones till May of this year, but I'm a complete convert -- which is why it took only 7 months to go from a 4.5" budget phone, to a 6" "phablet" with considerably more power and speed. My opinion is that an ideal phone should be between 5 and 5.5 inches. With a screen that big you can easily enjoy media, games and maybe everything that you do with your phone. But if your hands are smaller and these phones are maybe too bulky for you than you should take a smaller device, or if you prefer to watch movies and a lot of youtube than you should aim for a bigger screen. Manufacturers made phones in all sizes, styles and functions so that we the costumers can freely choose the one that fits best our needs and taste. It is true that you can make a standard size that would fit everybodys needs but the best thing is that you dont have to. You can choose whatever phone you like and that is why I like android phones so much, because there is a phone for every user no matter the price or size or UI or whatever people are looking for in a new phone. You're right, one of the best things about Android is that there's something for everyone! Omar Hamwi perhaps have small pockets and small hands? My trusty old z ultra fits fine in my regular pants.. in my hands and to my face.. 6,4 Inch screen 18 x 9 cm ~ 7 x 3,5 inch. My current phone is 5.2, will go for a 5.5 next time. Being able to see the screen is the most important thing. You can squint, I have old eyes and don't want or need to. No one ever went to their grave wishing they had a smaller phone. 5 inch all the way. For me I find that the Galaxy S4 is the best phone from it's size and feeling of the touch, I tried many phones ( big new ones ) but I downgraded back to the 5.0 inch Galaxy S4. And for those who read and say wtf is this guy saying the Galaxy s4 is a 2013 phone get the hell out of there, I say that I customized the ROM as I want it to be ;) Any way this is to support the opinion of 5.0 inch phones are the best to handle.